You’ve finally decided to tie the knot, and now you’re wondering where the host your last night of freedom. Do you stay at home or travel further afield in search of a wicked hen party experience? This article will argue both sides, weighing up the pros and cons of each decision, list some home and away hen party ideas and let you decide for yourself. Some would say a hen party is a special occasion that warrants a trip to a big city, such as London, no matter what the price. This is a once in a lifetime opportunity after all. What better time than now to get out there and see more of the world? It goes without saying that the biggest cities have the biggest clubs, so if you’re heavily into the clubbing lifestyle, visiting a big city is a must in terms of hen party ideas. Heart set on going away? See all our hen party locations across the UK. On the other hand, staying in your own city saves you money and doesn’t stop you from having a fantastic time. All you really need for a great night out is good company. You don’t even have to leave your home to have a fun hen party experience! If you’re into arts and crafts, there are plenty of crafty mobile hen party activities for you and your friends to get stuck into. You could make knickers, perfume or jewellery, all in the comfort of your own home. Hosting your hen party in your home town might actually feel more special to you in a sentimental kind of way. Celebrating one of the most important moments of your life in the place you grew up in is certainly a special feeling. If you’re looking for an action-packed adventure of a hen party, it’s more than worth packing up and heading to the Lake District, where you can find an assortment of awesome outdoor activities in beautiful scenery, like kayaking and ghyll scrambling. Ultimately there's no right or wrong answer. There's pros and cons for both approaches. 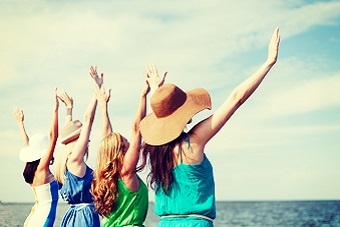 Now you know what home and away hen party ideas are out there, the world is your oyster! Whatever you do and wherever you go, you can find a variety of hen party activities on our website. Call us on 0161 341 0052 for more info.